Launch Party! | When Do They Serve The Wine? Fun was had by all at the launch party and round table discussion for my book on Wednesday. Tricia Gesner from the Cartoonbank took most of these wonderful photos–thank you! I will post more later today. Panelists were Roz Chast, Barbara Smaller, Drew Dernavich and Zachary Kanin. Thank you to Anelle Miller, and the crew at The Society of Illustrators, and to Chroncle Books for hosting the party! This entry was posted in About the book, Events, News and tagged Barbara Smaller, Chronicle Books, Drew Dernavich, New York City, New Yorker, Roz Chast, Society of Illustrators, Zachary Kanin. Bookmark the permalink. 1 Response to Launch Party! 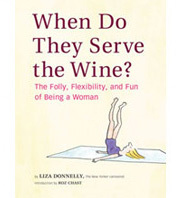 Pingback: lizadonnelly.com » Blog Archive » Launch Party for When Do They Serve The Wine?